When we think of the French Riviera, or Cote d’Azur, we tend to picture the beautiful coastline, with its glamorous towns and picturesque settings inhabited by billionaires, royalty and celebrities. Yet venture inland a little and you’ll find plenty of towns and villages that offer a simpler and less expensive way of life, all within easy driving distance of the coast. The French Riviera has no defined borders, but is usually accepted that it stretches from Menton in the east to St Tropez in the west, encompassing the principality of Monaco, and the coastal towns of Nice, Antibes, Juan-les-Pins, Golfe-Juan, Cannes, Ste Maxime and Fréjus. Let’s now take a tour of some of the lesser-known, hidden villages, which, while not as famous or as glamorous as their neighbours, all have plenty to offer in their own right. We’ll start from the east, and the stunning coastline between Menton and Nice, where the villages of Cap d’Ail, Èze and Beaulieu-sur-Mer are favourites of the super-rich, from Microsoft co-founder Paul Allen to U2’s frontman Bono. Venture inland, however, and the roads are steep, climbing high until you find yourself in a rugged hinterland, with narrow twisting roads popular with cyclists, and mountains studded with villages perchés, or perched villages. Two of the best known are Peille and Peillon, named after the River Peillon which flows between them. Peille has medieval architecture, narrow streets and little squares, as well as a twelfth century church and the ruins of a thirteenth century castle. Its neighbour Peillon, a fortified mountain village, was made famous by chef Robert Carrier in his book Feasts of Provence. He described his adventures when visiting its L’Auberge de la Madone for lunch, expecting the journey to take around twenty minutes from Nice. Unfortunately he took the wrong turning and ended up completely lost, and it was well into the afternoon when he finally came across the ‘saffron and rose-tiled rooftops and cosy brown shutters’ of the auberge. Yes, the roads are tricky, and not for everyone! However, between Nice and Antibes the landscape opens up and becomes far more accessible, and there are several delightful villages within easy reach of Nice Cote d’Azur airport. They include Saint-Jeannet, which is nestled under the distinctive mountain the Baou, and as such is extremely popular among hikers and rock climbers. The village’s main claim to fame was its appearance in the 1955 Alfred Hitchcock caper To Catch A Thief, where the Baou provided a stunning backdrop to Grace Kelly and Cary Grant’s blossoming romance. The village also enjoys panoramic views stretching from Nice to the Cap d’Antibes, and is home to one of the region’s smallest independent wine producers. Nearby Vence is an attractive working town which boasts France’s smallest cathedral, located in the heart of its medieval walled city. It’s a true foodie town, with some eighty restaurants and cafés, and a food street in the old town rumoured to be the one of the most prestigious in France. Like many Riviera towns and villages, it has a strong artistic scene, and was favoured by the likes of Marc Chagall, Raoul Dufy and Henri Matisse, who designed its Dominican chapel, La Chapelle du Rosaire de Vence. With its stained-glass windows, murals and abstract images, it is widely regarded as one of the greatest religious structures of the twentieth century. 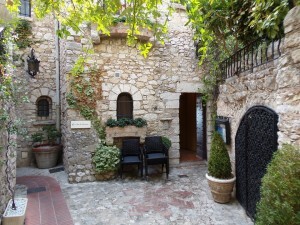 Close to Vence lies the famous Saint-Paul-de-Vence, a popular spot with celebrities, in part thanks to its extraordinary hotel and restaurant, La Colombe d’Or. After the war, it became a favourite with celebrities and artists, who’d pay for their supper in art – every wall is covered in gallery-worthy paintings by Braque, Miro, Chagalle and Fernand Léger. Today, the village’s narrow main street is lined with galleries and gift shops, making this a popular tourist destination. While Saint-Paul is as expensive as it is exclusive, nearby Tourrettes-sur-Loup has an arty vibe without the price tag, and produces crafts including pottery, weaving, sculpting, painting and jewellery-making, as well as confectionery such as candied fruit and violet-based treats. Another village perché, it also has incredible views of the Loup valley down to the coast. Nearby, also located on the Loup river are the lovely villages of La Colle-sur-Loup and Bar-sur-Loup, with its ruins of a viaduct, and restored castle, now a hotel. 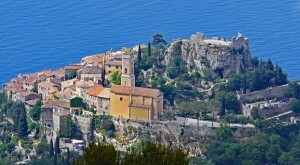 While many visitors speed along the A8 motorway heading west from the airport, they overlook one of the coastline’s more down-to-earth resorts, Cagnes-sur-Mer, with its neighbours Haut-Cagnes – a medieval hamlet atop a hill – and Cros-de-Cagnes. This is a working, local area, where modern developments jostle for space among the more traditional. It’s very popular for its horse-racing hippodrome, and the Renoir museum where the artist lived and worked, but its main attraction is its four kilometre long strip of beach and promenade, lined with restaurants and bars. Close by, the town of Villeneuve-Loubet is widely regarded as a ‘hidden treasure’ of the Riviera, with its castle, medieval church, narrow winding streets and popular Provençal market. On the coast its Villeneuve-Loubet Plage has over two kilometres of beach lined with modern beach resorts, linking Cagnes-sur-Mer with Antibes. 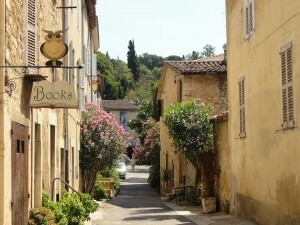 The hilltop village of Biot, overlooking a landscape of mimosa and olive trees, is known for its pottery and glasswork, but it’s also home to the Fernand Léger museum, and has many other arts and crafts galleries. Antibes, Valbonne and Mougins make up a very wealthy and famous triangle popular with expats, largely due to their proximity to the high-tech business park of Sophia-Antipolis and the international school of Mougins. Antibes, on the coast, is also an important yachting hub, with international crew members adding to the town’s youthful, cosmopolitan atmosphere. Valbonne, with its large square and grid-like Roman streets, retains much of its sixteenth century charm. 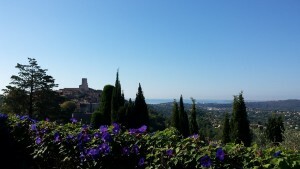 Mougins, being just a fifteen minute drive from Cannes, is a popular tourist destination, with plenty of restaurants, gift shops and art galleries. South-east of Mougins lies Vallauris, once the home of Picasso, who would have enjoyed its incredible views of the bay of Cannes, the Isles de Lérins and the Esterel mountains. Perhaps inspired by its famous resident, the village has a lively arts and crafts scene that focuses particularly on pottery and ceramics, as well as a popular Provençal market. Around the perfume capital of Grasse there are many delightful places, such as the village perché of Opio to the east, which enjoys a mild micro-climate and supplies many of the roses and jasmine used in the famous Grasse perfumes. Further west, and inland between the coastal towns of Cannes and Fréjus, lie the famous nine village perchés of the Pays de Fayence: Bagnols-en-Foret, Callian, Fayence, Mons, Montauroux, Saint-Paul-en-Foret, Seillans, Tanneron and Tourrettes. Each has its own particular charm, with medieval churches, ancient fortresses and archways, cobbled streets and shady squares, and of course breathtaking, spectacular views – and all are a short drive from Cannes, Fréjus and Grasse, making them both idyllic and practical places to live. Just a few kilometres inland from Fréjus lies the village of Roquebrune-sur-Argens, which is a wonderful location for the great outdoors, set at the foot of a mountain, and is a renowned producer of honey, wine, olives and cheese. Further south-west towards St Tropez, the village of Le Plan-de-la-Tour was home to Johnny Depp and Vanessa Paradis for many years, chosen perhaps for its isolation, nestled as it is in the scenic landscape of gentle, tree-covered rolling hills. 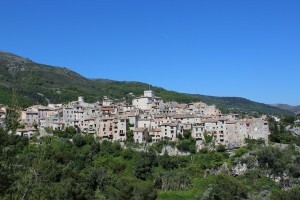 The final stop on our journey is La Garde Freinet, a medieval mountain village located in the Massif des Maures, just fifteen kilometres from St Tropez. It’s charming and picturesque with its own fort, a delightful church and a clock tower, and is also an ideal starting point for hiking and mountain biking. One of the real joys of the French Riviera is that, once you turn away from the busy coastline and its congested roads, you’re never far away from beautiful countryside and stunning villages that remain lively and open all year round. There is so much more to this area than the sea, and better still, much of it is still affordable – even if you don’t count yourself among the super-rich!